I heard on the radio today that the Salvation Army red kettle donations are down this holiday season. That’s sad. Almost as sad as the news a year or so ago that some retailers will not the Salvation Army set up in or near their stores…that to me is inexcusable as the Salvation Army has done nothing but good for those in need. Fortunately in NYC this past weekend on many street corners and this week when I was at a Shopko in Green Bay, the Salvation Army and their volunteers were out in force. Thank you New York and thank you Shopko! 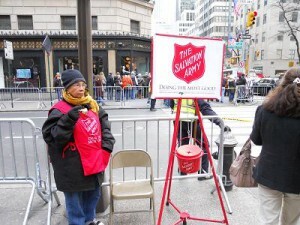 I don’t have any affiliation with the Salvation Army other than to throw some money into a kettle once or twice a year. It truly does NOT matter how much you can give (seriously, loose change is fine…dollars are better, etc) and no you don’t have to give every time you see a kettle but please donate to the Salvation Army if you haven’t already. Just once is fine. If you have a blog or a facebook or twitter account, please promote this post…not for me or for SEO but for people who need our help. Even better, if you want to write about this yourself, please do…and you can use my picture from this post as well. I took the picture not knowing about today’s news report but because watching people walk past this kind lady ringing a bell as if the bell was just more background noise broke my spirit a bit. Maybe, I hoped silently as I left St. Patrick’s Cathedral – the edifice she was standing in front of, they had already given at another kettle. A little internet and social media love for the Salvation Army might be just the little reminder some folks need. Thanks.